Sauerkraut is fermented food and a prebiotic. This old-world food is a hot food trend you can make at home! DIY food projects are keeping experimental cooks busy this summer. Count me among them. I’ve made sauerkraut and fresh cheese and dehydrated a few things. Simple? Yes. Worth it? Yes, but not sure I’ll repeat some of them. My dad remembers sneaking down to the cellar to nibble from his mom’s crock of ‘kraut. So that story got me started. Since she’s not able to guide me, I searched for recipes. That Internet search resulted in, oh, about 1,850,000 options. Sauerkraut is a fermented food. Fermentation involves yeasts and molds, so food safety rules reigns supreme. I narrowed the results to research-based recipes. That’s where University Cooperative Extension is my go-to resource. This year marks 100 years of work in Wyoming, so they have lots of research behind them. To find the Nutrition and Food Safety free handouts with recipes and instruction online go to www.uwyo.edu then search for Food Preservation or National Center for Food Preservation. Sauerkraut is a probiotic. Probiotic foods have “good” bacteria that help keep a healthy balance in your gut. Specifically, foods rich in fiber and plant compounds (the following links take you to more recipes) such as whole grains, fruits, vegetables, nuts, and legumes (split peas, black beans, pinto beans, and lentils) satisfy the gut bacteria. Fermented foods and those with live, active cultures such as yogurt, kefir, miso, kimchi, and unpasteurized sauerkraut and pickles (make your own or find in the refrigerated section at the grocery store) contain beneficial bacteria which helps keep the gut healthy. Food preservation, such as canning and fermentation, has evolved over the years so best not to rely on your grandma’s recipe. These updates reflect changes in food varieties, bacteria and knowledge about canning. Plus Wyoming’s altitude requires special consideration on cooking time and temperature. Back to my sauerkraut. I scrubbed a large crock to get going then used my food processor to shred cabbage. I don’t eat a lot of sauerkraut, so had lots of leftovers. I loved seeing the science at work, but doubt I’ll make it again any time soon. But don’t let me discourage you from trying your own batch. A 1-gallon container is needed for each 5 pounds of fresh cabbage. A 5-gallon stone crock is of ideal size for fermenting about 25 pounds of fresh cabbage. Food grade plastic and glass containers are excellent substitutes for stone crocks. Other 1- to 3-gallon non-food-grade plastic containers may be used if lined inside with a clean food-grade plastic bag – not a trash-can liner. Work with about 5 pounds of cabbage at a time. Discard outer leaves. Rinse heads under cold running water and drain. Cut heads in quarters and remove core. Shred or slice to a thickness of a quarter. Put cabbage in a suitable fermentation container and add 3 tablespoons of salt. Mix thoroughly, using clean hands. Pack firmly until salt draws juices from cabbage. Repeat shredding, salting, and packing until all cabbage is in the container. Be sure it is deep enough so that its rim is at least 4 or 5 inches above the cabbage. If juice does not cover cabbage, add boiled and cooled brine (1-1/2 tablespoons of salt per quart of water). Add plate and weights; cover container with a clean bath towel. Store at 70º to 75ºF while fermenting. At temperatures between 70º and 75ºF, kraut will be fully fermented in about 3 to 4 weeks; at 60º to 65ºF, fermentation may take 5 to 6 weeks. At temperatures lower than 60ºF, kraut may not ferment. Above 75ºF, kraut may become soft. 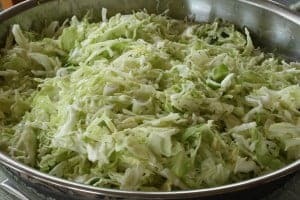 If you weigh the cabbage down with a brine-filled bag, do not disturb the crock until normal fermentation is completed (when bubbling ceases). 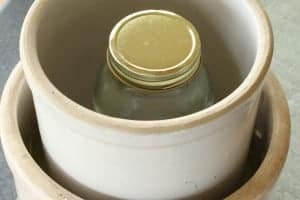 If you use jars as weight, you will have to check the kraut 2 to 3 times each week and remove scum if it forms. Fully fermented kraut may be kept tightly covered in the refrigerator for several months.